An Eagle was mortally wounded by an Arrow. As he turned his head in the agonies of death, he saw that the Arrow was winged with his own feathers. 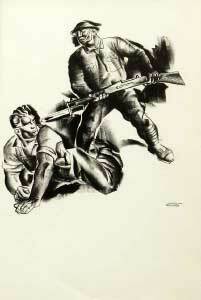 Hugo Gellert, A Wounded Striker and the Soldier, 1930. Lithograph, 13 ½ x 12 ⅜ in.